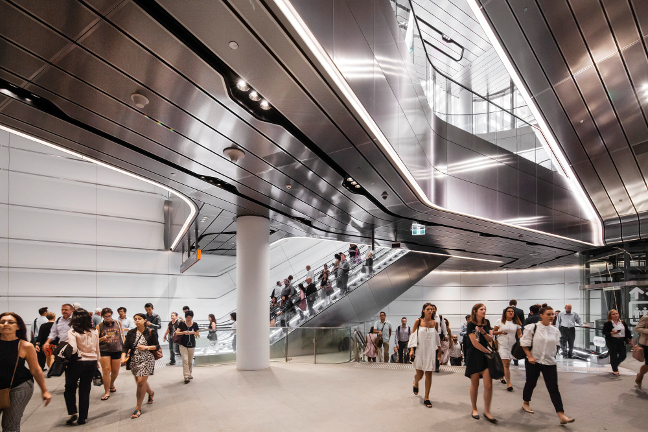 Connecting one of Sydney’s busiest transport interchanges to Barangaroo through architectural expression, Wynyard Walk has created a unified identity and civic presence, delivering a socially sustainable piece of infrastructure to Sydney’s CBD. 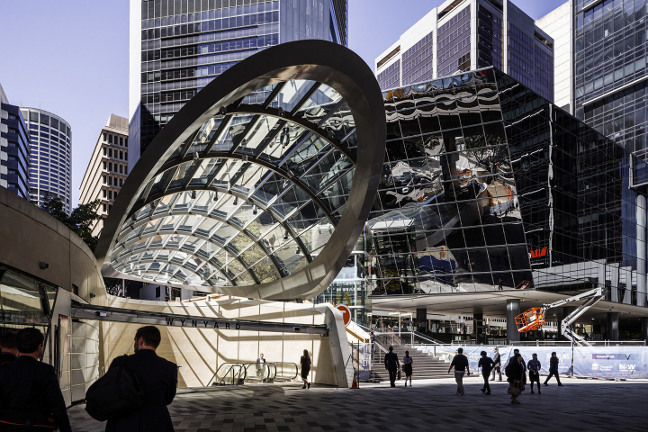 Linking Wynyard Station to the western corridor of Sydney’s CBD, Wynyard Walk consists of a series of above and below ground urban interventions including a nine-metre wide pedestrian tunnel, bridge, plaza and a new civic building connecting the existing Wynyard Station. Earthen materials including concrete and stone ground the project, while lighter elements such as glass and metal provide diaphanous canopies filtering natural and artificial light. 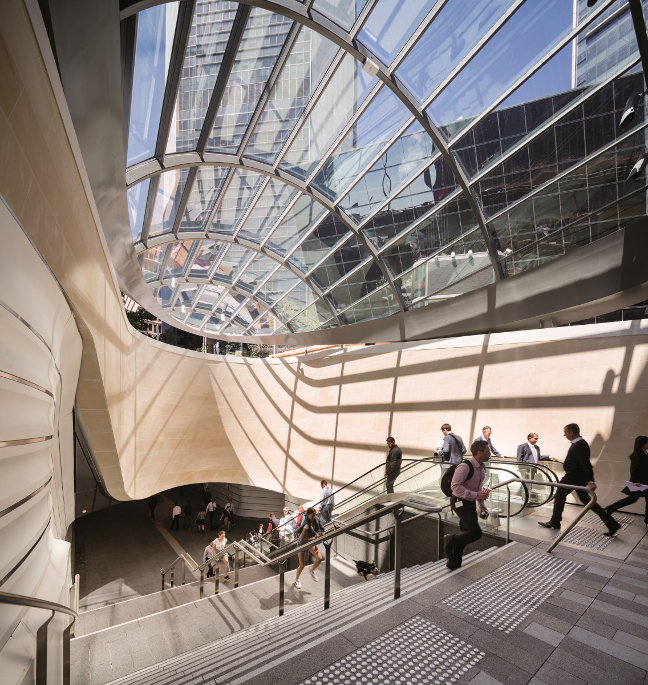 The western portal and glass canopy acts as the most visible landmarks of the project, increasing traffic capacity of the station to meet current and future demands. The shape of the canopy was parametrically modelled and tested in wind models to ensure weather protection while allowing fresh air and natural light into the tunnel. The innovative form has geometric rationality, sculpted and cut from a cylindrical section and elliptical plan. The design concept of flow draws on the natural geology of the Sydney Basin, with its landscape of deep cliffs, gorges, beaches and estuaries carved by erosion. A metaphor for the fluid flow of pedestrians, the design references the movement of water as, like water, people follow the path of least resistance. 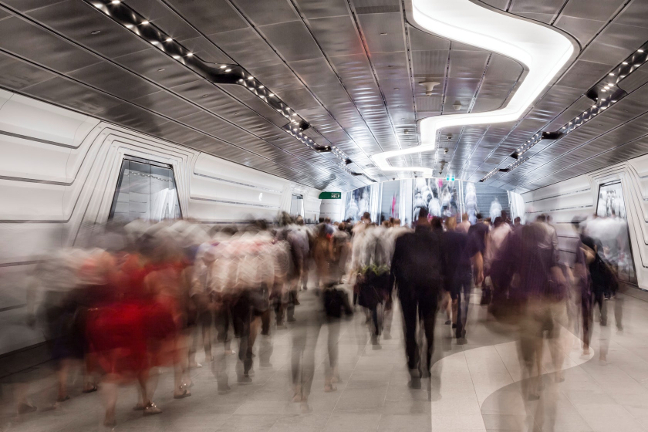 The linearity of movement is reinforced through materials and detailing to enhance wayfinding and create a unified experience.